We have heard for a long time how 3D printing has the potential to revolutionise the construction industry but it is only recently that a company has actually put these ideas to the test. In a trial in March 2014, a Chinese company known as Winsun revealed that it had created 10 concrete houses in 1 working day, using a 3D printer. Back in January 2015, Winsun went on to unveil a 3D printed 1,100 square-meter villa and a five story apartment building, raising the questions of whether this technology was on the verge of becoming a viable solution in the construction industry. A technology company in China has gone from 3D printing model houses to life-size, fully functional buildings. Winsun’s promotional video in their showroom features their construction industry 3D printer. The film reveals how the “ink” is made from ingredients such as steel, cement, rubble, fiberglass and binder. It takes approximately 24 hours for the ink to dry. The 3D printed buildings have ribbed-finish printed walls, which are completely hollow inside, apart from a corrugated filter. This was purposely designed to save on the cost of materials, without sacrificing the strength of the walls. According to Winsun, it took just eight people just one month to complete from start to finish a £105,000 luxury villa using 3D printing methods. It’s estimated that using traditional building techniques it would likely take thirty people over three months to complete. Using 3D printing technology, both time and money is saved. According to the latest reports, the government of Egypt has ordered in excess of twenty thousand single-storey houses. Winsun is to provide a 3D printer, the formula for the ink will mainly comprise of sand. All of the dwellings will be printed at the permanent location of the property. 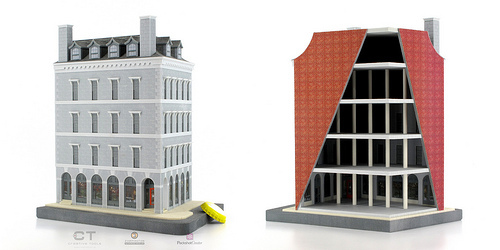 3D Printing to Address Worldwide Housing Shortage? If this solution becomes commercially viable, it is hoped that it may be used to address a worldwide shortage of low-income housing. Seeing as 3D printing allows for big time and cost savings, it is believed that the government will feel more encouraged to build affordable homes. Whether or not this will be the case, only time will tell! However not all architects are convinced that 3D printingis the right move for the architectural and construction industries. Some believe that this ‘cookie cutter’ approach to architecture could lead to a loss of integrity in the industry.